Odisha Channel Bureau Kendrapara, April 8: Forest personnel have rescued a rare owl conferred endangered status under wildlife protection Act from a village on the fringes of Bhitarkanika national park in Odisha. The winged species had made its way into a house of forest-side village.The avian species which was most probably attacked by a predator in forest had sneaked into a house in Iswarpur village after a hectic nocturnal flight.The bird was in distressed condition.After the house owner along with locals informed the forest staff of the act of trespass of the ‘feathered guest, we rescued it and later released it into the wild.“I was scared to spot the bird perched atop a wooden plank of the house.Neighbours rushed to my house to catch glance of the nocturnal visitors.I ensured so that no harm is caused to the rare bird.Some people believed that the owl which was partially white complexioned is a harbinger peace”, narrated the house owner, Chandramani Parida from park-side Iswarpur village.Because many people had crowded the house to have a look at the bird, it was disturbed and had gone panicky.We ensnared it in a net and released it in the mangrove forest of the national park.It was found to be safe and in perfect shape, said Forest Range Officer, Akshaya Kumar Nayak. 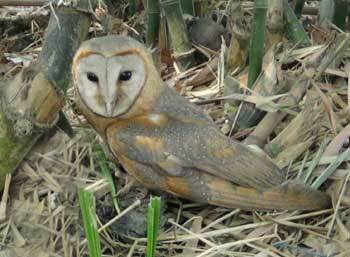 The barn owl which was rescued is a protected species under schedule 3 of Wildlife (Protection) Act, 1972.Barn owls specialise in hunting small mammals which they locate by sound.Bhitarkanika is a safe and congenial habitat for owls.Though no headcount of these species has been done yet, the national park is home to over 100 barn owls, the official added.